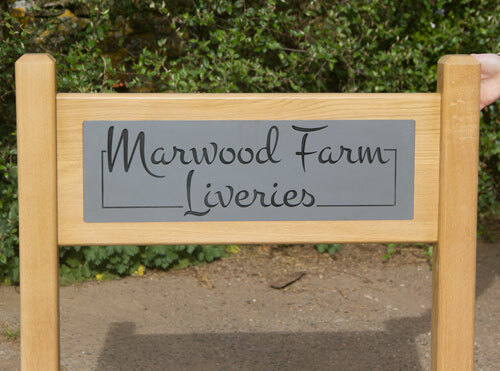 Superior Entrance Sign on Posts with Engraved Insert. These superior entrance signs are beautifully crafted. The posts and the inner panel are solid oak. These can be left looking like natural oak by treating with a tough satin finish varnish. Other colours mixed for us @ £55 per order. (not per sign) We are able to match any Farrow & Ball colours. A recess is carved into the oak so that the corian plaque can be neatly inserted into it. Corian is a very hard wearing material which looks and feels like stone. It is actually stone dust, bonded together with a weather-proof resin. 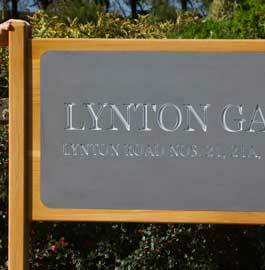 We engrave your house name into the corian and then paint the letters. The lettering is available in a huge range of fonts. Letter colour can be white, black, gold, silver, grey, F&B studio green or indeed the same colour as the painted oak - see above. Choosing the same colour for the oak as the lettering and a contrasting colour for the corian can produce a really stunning entrance sign. 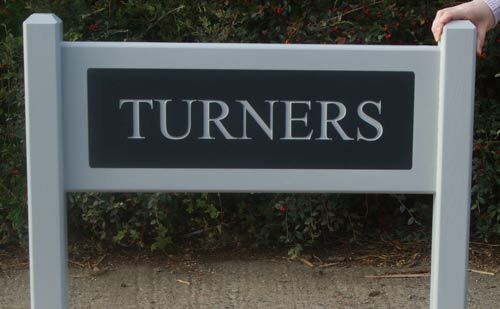 If the prices above are over your budget then consider our oak framed aluminium composite entrance signs. These are very good value with prices starting at £133. They can also be made double sided. 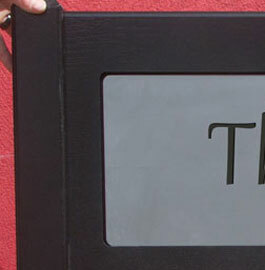 The aluminium composite is available in a range of colours as is the vinyl lettering. The frames and posts can also be painted. 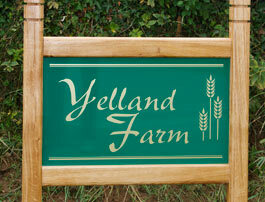 Other possibilities include large slate signs on wooden posts or large wooden entrance signs.